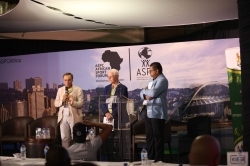 Day 2 marked the close of the 1st ASPC African Sport Forum at the Moses Mabhida Stadium in Durban. The 1st ASPC African Sport Forum was hosted by Association of Sport Performance Centres (ASPC) in partnership with the KwaZulu-Natal Department of Sport and Recreation. The event was also supported by the South African Sports Confederation and Olympic Committee (SASCOC), the eThekwini Municipality and the Durban Chamber of Commerce and Industry. Day 2 covered the pathway to the podium, high performance and leadership in sport and began with an athlete panel discussion with past and present elite athletes discussing the initial topic of the pathway to the podium. The other topics for Day 2 included African Union Sports Council (AUSC) Performance Pathway Programme presented by Stanley Mutoya, CEO of the AUSC Region 5; World Ranking of Countries in Elite Sport presented by Nadim Nassif, Assistant Professor in the Department of Psychology, Education and Physical Education, Notre Dame University; Understanding Accountability in Leadership presented by Dr Phatho Cele-Zondi, CEO of the Sports Science Institute of South Africa; and Building Leaders in Your Organisation presented by Dale Henwood, President of the ASPC. Each session was very interactive with each topic followed by a related panel discussion. KwaZulu-Natal MEC for Arts, Culture, Sport and Recreation, Bongi Sithole-Moloi, said the Department was pleased with the progress achieved over the past two days. "We are confident that the past two days have been beneficial to all sport practitioners who participated in the Forum deliberations," said Sithole-Moloi. "The Forum included very important topics and empowerment sessions that are relevant to our athletes, administrators and technical officials. We appreciate the partnerships that have been established and we are confident that these will go a long way in charting a development pathway that is tailor-made for African conditions," concluded Sithole-Moloi. Zandile Gumede, Mayor of eThekwini Municipality, thanked all delegates for their insight and participation at the Forum. Gumede said, "With the ideas and experiences shared over the two days, I am confident that together we will be able to take the sports fraternity in Africa to greater heights and become world leaders." "I hope that the young athletes have learnt a lot from this session and they will go out there and continue to work hard to ensure that they become leaders in their respective fields," concluded Gumede. Durban Chamber President, Musa Makhunga said that the Durban Chamber remains committed to empowering people to become active participants in our economy as well as providing access to networks and markets as well as platforms that are conducive with creating sustainable, inclusive economic growth. "ASPC Workshop (Life After the Podium), created by the Durban Chamber to empower athletes with the business and life skills to continue to support themselves and their families after their careers have ended is critical," said Makhunga. "Athletes already have the right attributes and qualities that make people successful entrepreneurs and business leaders. All they need is to be coached and equipped with the right skills, tools and support to convert these attributes into business success," concluded Makhunga. The Forum shared knowledge and best practice, through the interactive programme of topics and related panel discussions, with approximately 600 sports leaders, administrators, coaches and athletes from KwaZulu-Natal and across the Continent over the course of the 2-day 1st ASPC African Sport Forum as well as the ASPC Workshop (Life After the Podium) which ran in parallel to Day 1 of the Forum. Dr Kevin Subban, ASPC Continental Vice-President for Africa, brought the final day of the Forum to a close by thanking all the delegates for attending and the speakers and panellists for contributing to the wealth of knowledge and experience shared at the Forum and the Workshop. Subban said, "A special thank you for the KwaZulu-Natal Department of Sport and Recreation for recognising the importance of hosting this Forum on the Continent and for giving its full support in the journey that led up to hosting the Forum and the Workshop." "I would also like to thank, the South African Sports Confederation and Olympic Committee (SASCOC), the eThekwini Municipality and the Durban Chamber of Commerce and Industry for contributing to the Forum and the Workshop," added Subban. "The sporting community in Africa needs to now apply the lessons learnt and knowledge shared at the Forum, and to capitalise on the goodwill fostered through the connections and networks made at the 1st ASPC African Sport Forum," said Subban.